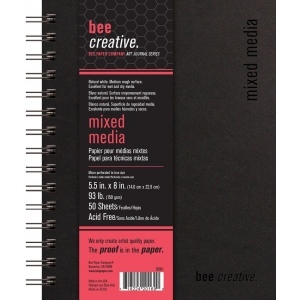 Acid free natural white sheet has an excellent surface structure for a wide use of mixed media an excellent addition to any artist's sketchbook repertoire. 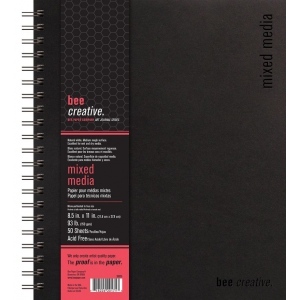 * Distinctly two sided with a cold-pressed pronounced texture for dry media on the top side and a smoother hot-pressed surface for pen and ink and mixed media on the bottom side. 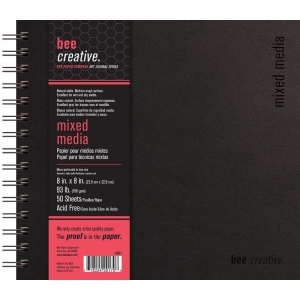 * The double wire binding creates a flat surface allowing the artist to draw across the page. * The sturdy black chipboard cover can be personalized with acrylics to make your journal as distinctive as your artwork! Extra heavyweight 100% recycled chipboard front and back cover make these books perfect for field work. * Micro-perforated to true size for easy sheet removal. * 93 lb. (150 gsm).